I wish my students loved to write as much as I do. I feel every year I am faced with the same struggle; students have no writing stamina and tend to complete any creative writing task in a few minutes. This year I decided to change the way writing looked in my class. I wanted students to enjoy writing and see how their writing has changed over the year. 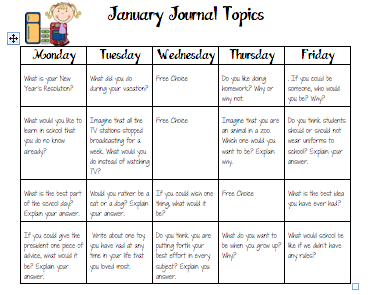 I created this Journal Writing Calendar (you can find it in my TPT store) to help students build their writing stamina. I have to admit, in the beginning of the year, it was a struggle to get my class motivated to write creatively, include elaborate details, and strong word choices, but they have now started to become writers!! I use the journal writing calendar daily. It has helped my students build their writing stamina tremendously! Everyday we do a "quick write" they have 10 minutes to write as much as they can about the topic of the day (which is on the calendar). When the 10 minutes are up, they count the number of words they wrote. At the beginning of the year, most of my students were writing on average 60 words, which is not a lot in ten minutes!! After reviewing their writing notebooks this semester, most of my students are writing over 150 words!! I am so excited about this, and my class is too! They are eager to share the number of words they have read with the class. Not only are they building their writing stamina, but their overall writing has improved! I just finished reading a detailed, descriptive, and beautifully written quick write about winter vacation. The best part of doing this daily writing activity, is the excitement from my class. They can't wait to share their writing as well as listen to their friends. It's amazing to see how this 10 minute activity has helped build writing stamina! It has also improved the quality of their narrative stories as well as helping with time management. I love this for writing. We did something similar at the beginning of the year with writing warm ups. It really makes a difference in their writing stamina! Thanks so much for stopping by, Jennifer! Hopefully when we get more followers, we can sign up for a TPT product swap with you guys!